Maria De Jesus leans against the metal fence that blocks the Rio Grande, a river that for centuries has marked the division between El Paso, Texas and Ciudad Juarez, Mexico. A native of Durango, Mexico, Maria, 82, has traveled more than 600 miles by bus for the chance to see her only son and 15-year-old granddaughter. She saw them last 12 years ago when they emigrated from Durango to El Paso. “I didn’t know my granddaughter; I hadn’t seen her since she was 3 years old, and it’s not the same watching them grow in pictures,” De Jesus said in Spanish. On a recent sunny October day, De Jesus was among the 300 families, or more than 1000 people, waiting in line on the Juarez side of the river for a chance to spend three minutes with their loved ones on the U.S. side. The site for the reunion is near Santa Fe Street, in downtown El Paso, and is known as Chihuahuita Park. Fernando Garcia, founder of Border Network, said the purpose of the event was to show the reality that many immigrants face today: the separation of families by political and geographical boundary lines. The issue was at the forefront of the divisive and heated race for the White House, with now President-Elect Donald Trump calling for mass deportations of undocumented immigrants and promises to build a “huge wall” between the U.S. and Mexico. 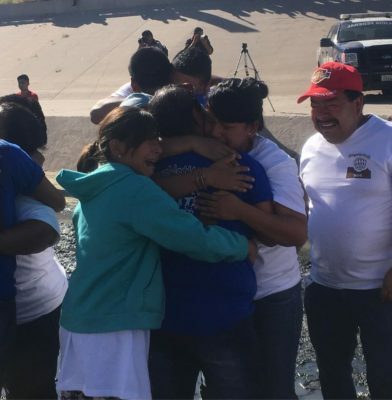 During the four-hour event meant groups of 10 families at a time were allowed to meet their family members from El Paso at the middle of the empty, muddy riverbed for just three minutes, enough time for a few hugs and kisses before returning to their respective sides of the border. The Border Network coordinated the October 30 Hugs Not Walls event with cooperation of government agencies as the International Boundary and Water Commission, U.S. Customs and Border Patrol and Mexico’s Federal Police. U.S. residents that gathered at the border fence dressed in blue Border Network tee shirts and Juarez residents wore white tee shirts. The family groups that reunited consisted of men, women and children of all ages.